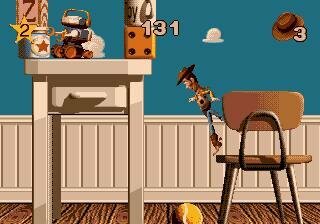 Given Toy Story had its original roots on the computer, you’d expect a game based the things would be an instant hit. 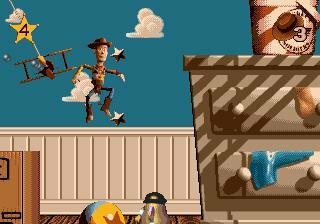 Unfortunately, the film’s license and cast of colorful characters seem to be the only elements that survived this attempt to bring Toy Story’s big-screen delights to your PC monitor. 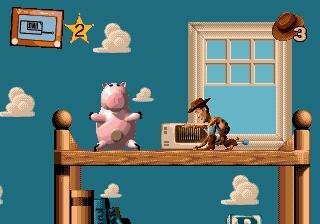 Originally rushed to market on the Sega Genesis to coincide with the film’s release, this port of the 16-bit game bears all the marks of a hastily assembled action game with little flair or originality. 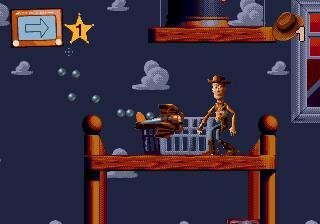 The PC version of Toy Story gives you the task of guiding Woody, the hapless and jealous cowboy doll, as he attempts to recapture little Andy’s love from the shiny and cocksure Buzz Lightyear. On the surface, it’s very similar to the movie, and when the game begins, it follows the plot of the film closely enough. 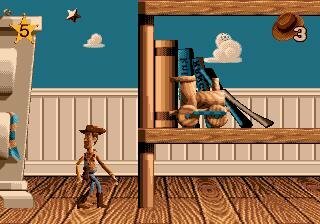 There are a few deviations from the original story line — but those can be put down to artistic license and the simple fact that this is a game, not a movie. Unfortunately, after five or six levels, the plot wavers, and that artistic license becomes a license to kill the storyline). 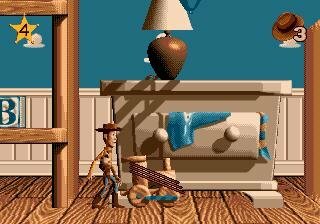 And precious little innovation is evident in the creation of the game’s environments or levels. The game is laid out with the same simple design you’ll find in scads of other uninspired running-jumping-climbing games; you move to the right across a two-dimensional, side-scrolling playing field, leaping from platform to platform and jumping over bad guys. 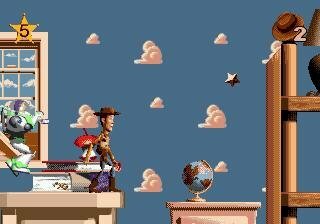 This brings us to the first of Toy Story’s many problems: The game is limited to two dimensions of gameplay, and when you’re called to jump from a precarious perch to, say, a floating tennis ball off-screen, it’s difficult to gauge exactly where in space you really are. It’s also difficult to tell if an object in your path is a barrier or a background object, as there’s no difference in appearance. It’s all down to trial and error. 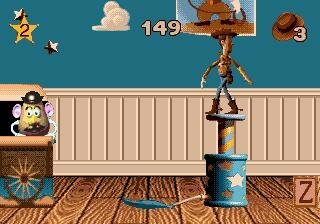 In fact, most of the game isn’t really played, but bungled through until you figure out the correct pattern. 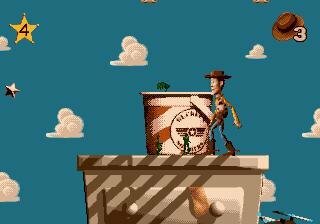 In addition, Woody has been scaled so large on the screen (perhaps to appeal to younger gamers? ), it’s impossible to see what’s coming up. You’ll invariably end up getting frustrated from the ongoing failures that you can’t really be blamed for. 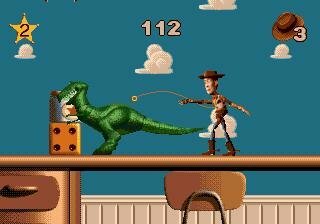 A few levels of this gameplay and not even the old Toy Story charm can save this game.